Have you got a Doctor emergency? Well don't worry, we'll be there in a hurry with the Doc Mobile from Flair! Everyone's favourite Doctor is now on the move complete with her own mobile check-up centre -'The Doc Mobile'. 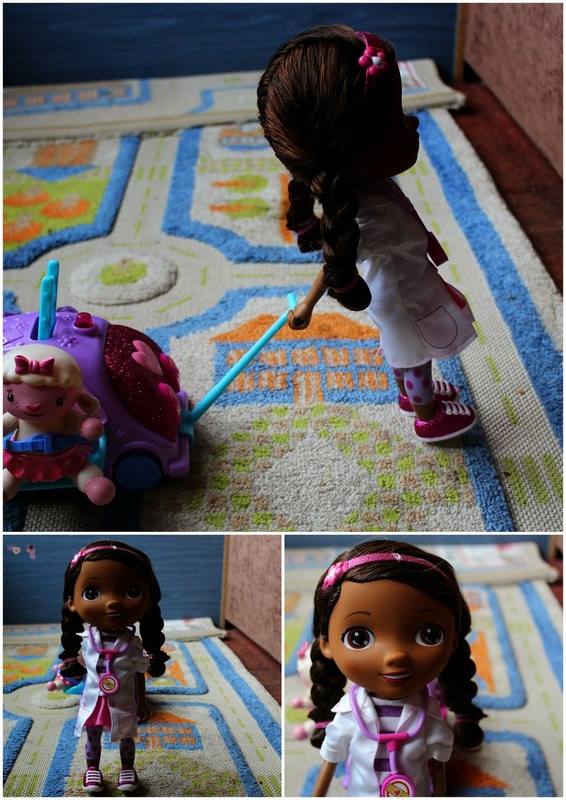 The Walk N' Talk Doc Doll really walks, pulling her Doc Mobile along with her. The Doc Mobile has a special seat for Lambie so she can ride along too. The Doc sings the catchy 'Doc Mobile' Song as she pulls along Lambie on the Doc Mobile with its flashing light. The back of the mobile opens for storage so that Doc can take her tools with her on the go! You also get a Lambie figure and 3 small tools. It's suitable for ages 3 and above and requires 3 x AAA batteries (included). 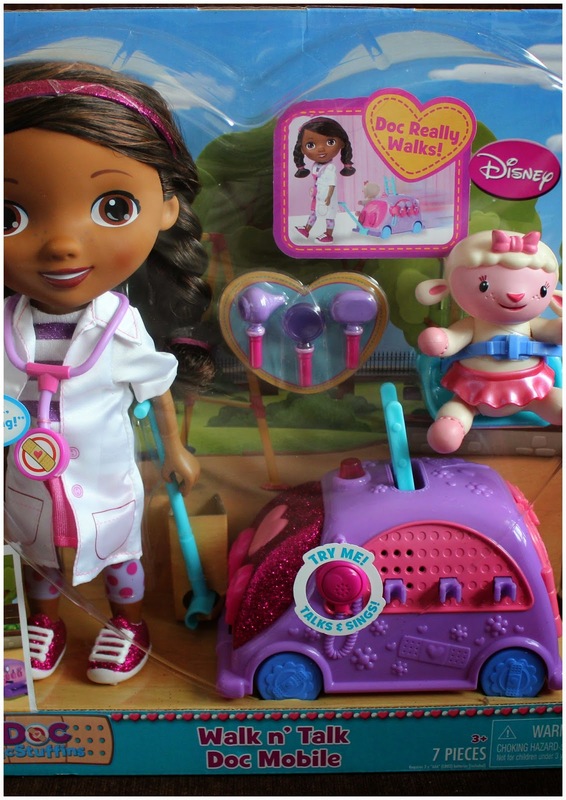 The Doc McStuffins doll is just beautiful, she's such a pretty doll with a gorgeous face. Her hair is cutely plaited into two pigtails with a pretty pink hairband to finish it off. She comes dressed in her white Docs coat with her stethoscope around her neck. The Doc Doll really walks, she holds onto the handle which is attached to the Doc Mobile and off she goes. At the simple touch of a button she walks along singing and pulling her Doc Mobile behind her. My youngest two, Lily and Ryan are huge Doc McStuffin fans, they have so many of the toys from the range but this one went down so well, they loved it. 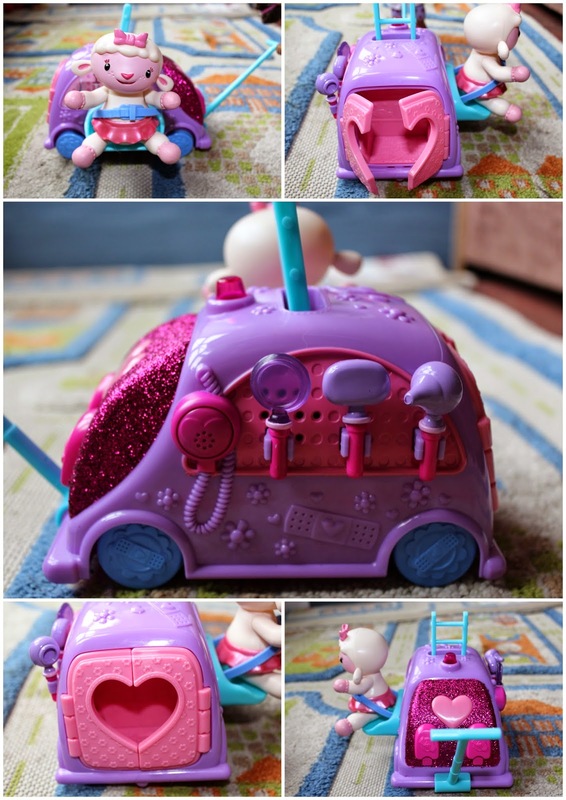 The Doc Mobile itself is so pretty, it's completely pink and purple like most Doc McStuffins things are. Lambie gets her very own seat on the side so she can ride along too. There's 3 little tools that slot neatly into a holder on the side and there's also a set of little pink heart shaped doors which open and close at the back for extra added storage. Ryan loves watching the Doc walk around, he loves the song that she sings too. The Walk n' Talk Doc Mobile will cost you £49.99 which is quite a lot of money for both the doll and the Doc Mobile it works out about average. I'm sure this is going to be on lots of Christmas lists this year, it's a really delightful set of toys. The doll can be enjoyed separately or as part of the set. Which ever way you decide to play with her, I'm sure you'll love her. Disclosure: We received a sample for the purpose of this review. All the opinions expressed in this review are 100% honest and entirely my own.